We’ve had the Mixing Bowl (DC), the Orange Crush, the Can of Worms, so why not the Spaghetti Bowl? The interchange connects I-15, one the major north-south highways in the western U.S., with US 93, US 95 and I-515, which head eastward into downtown Las Vegas. It was reconstructed in the late 1990s into the version we see in the above photo. I have actually not spent much time in Las Vegas, and none of that time was on a highway in in a car. Indeed, I had a miserable experience about 12 years along the strip (South Las Vegas Boulevard). While I won’t get into the details of that trip, it did prevent me from exploring more of the actual city and what it has to offer. I would be willing to give it another chance, especially if I could also explore out into the desert. As one can see, this actually a larger and more complicated interchanged that it should be. I turns out I-380 was going to extend westward over the mountain ridge and to Highway 1 in the town of Pacifica (along the ocean), but this extension was never built, and at this point probably never will be. It would have crossed the San Andreas fault on unstable ground, and the area that would have been the right of way now has several residential developments. But the extra pieces of the interchange remain. 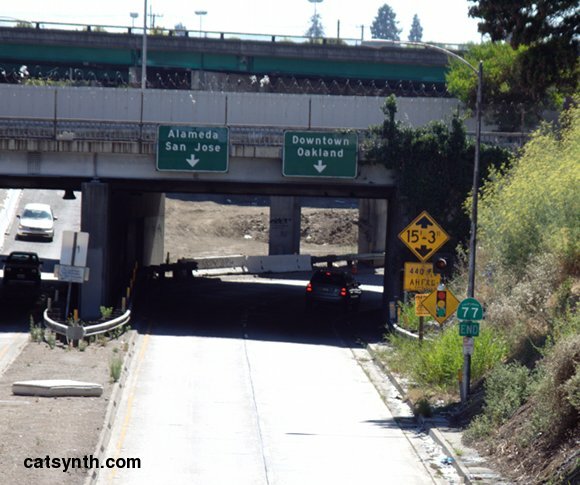 The roadway that would have been I-380 continuing underneath is often used by Caltrans to store equipment, while other parts like the unused bridges are pretty much abandoned. User jasonbentley on flickr has taken a series of photos on unfinished I-380/I-280 interchange. The freeway bed comes to a sudden end (all traffic is diverted to the ramps before this point). Beyond here, the right of way is crisscrossed with narrow gravel roadways. This unused bridge goes over the connecting ramp from southbound I-280 to eastbound I-380. Most people traveling on the roadway below have no idea this bridge is not in use. Do you have examples of unfinished or abandoned highways in your community? If so, please let us know. Another listless Sunday evening, another highway interchange. This is the bizarrely complex interchange of highways 401 and 427 near Toronto and Mississauga, not far from Toronto Pearson International Airport. They are known colloquially as “the 401” and “the 427”, similar to way highways are referenced in southern California. The 401 extends all the way to the western end of province to Windsor, just across the U.S.-Canadian border from Detroit. I have thought about a musical “401 tour” a few times, that would start in Detroit (and leave time for photography) and extend to Toronto. As such, leads on experimental musicians and performance venues along this route would be welcome. While shooting photos in an industrial section of East Oakland with a friend a few weeks ago, I came across a surprising section of highway that i had not noticed in the past. 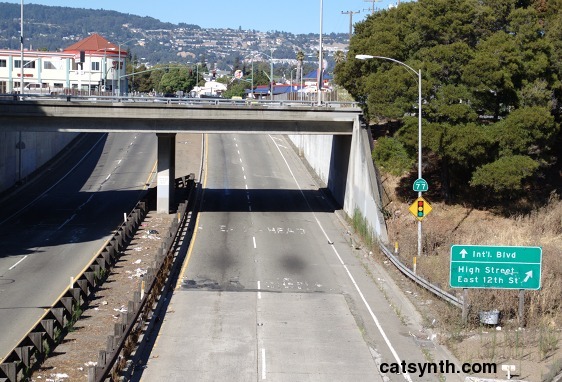 It turns out this is CA 77, a short freeway that stretches from International Boulevard, of the main streets in East Oakland, to I-880, and is one of the shortest in the state. 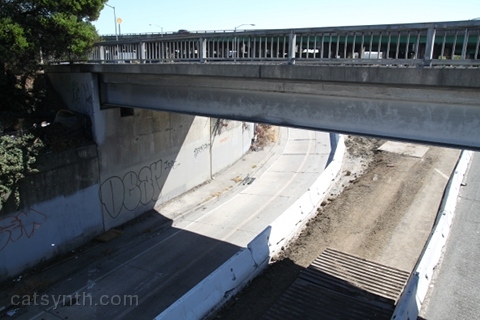 It starts at a street intersection with International Boulevard (CA 185), passes underneath San Leandro St and the elevated BART tracks and connects onto I-880 via the ramps (which mark the highway’s end). The overhead signs are actually hanging from a rail overpass, which I had walked along and was a rich source of photographic material, including a recent Wordless Wednesday photo with graffiti. Although there is a direct connection from the end of CA 77 to I-880, the converse is not true. There is not even a mention of highway 77 at the closest exist (High Street). However, it looks like there is a lot of construction going on at the now rather old and dilapidated interchange, so there might be a direct and signed connection in the future. 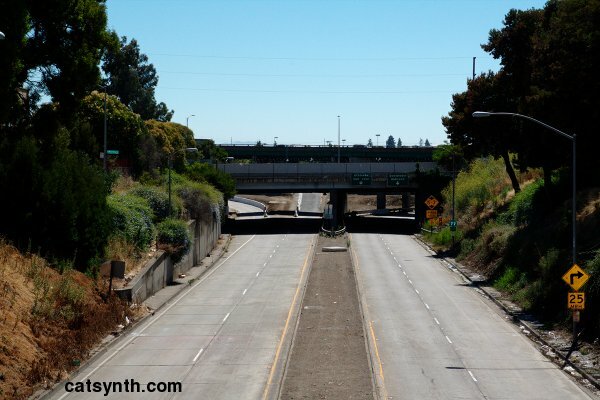 Going east from the San Leandro Street and BART overpasses, the highway has a single intermediate exit to East 12th Street. It then tilts upwards to meet International Boulevard at a traffic light. International Boulevard (CA 185) used to be known as East 14th Street, and was a rather infamous (and dangerous) corridor in East Oakland. Changing the name 1996 did not really change the situation. But from what I understand, it had been getting better, at least until the recession. According to the California Highways site, CA 77 is intended to continue further east to I-580, but it appears this is neither constructed nor signed on surface streets. They also mention that the stretch of freeway had been signed as CA 185 until 2008, and in fact I do recall once or twice seeing a sign to that effect when taking BART sound from Oakland years ago. Fun with Highways: the "Can of Worms"
I-490 runs left to right. I-590 enters at bottom left, changes to NY 590 at the double overpass (center), and leaves at top right. NY 96 (East Avenue) runs from bottom right to top left, passing over I-590 and under I-490 simultaneously…The brown line is the CSX railroad mainline…This interchange is familiarly called the “Can of Worms”, a name first applied to the original interchange at this location (see bottom photo). This was completely reconstructed between 1987 and 1991, resulting in the configuration shown above. Those who are interested are encouraged to visit the original article for more details and history.